In February I went on a volunteering conservation day set up by UCSU volunteering. We went to ‘The Helm,’ in Oxenholme, which is a rural site, maintained by a group called, ‘Friends of the Lake District’. This group of conservationists work to keep the area safe from fire hazards, ensure that the wildlife in the grounds remains healthy and so that it continues to be a beautiful part of the country for residents to go walking in. On this particular day, myself and 9 other volunteers, both from ‘Friends of the Lake District,’ and also from the Lancaster and Carlisle University of Cumbria sites, were helping to keep the area free from fire hazards. We were to be chopping down the gorse bushes on one side of the helm and then setting up a small fire to burn them. So when we arrived, we split up into different working groups. One group were in charge of cutting down the gorse bushes, another were to drag the branches to the bottom of the hill to be burned and the third group were to start a fire but had the difficulty of keeping it small and controlled, even though there were so many branches to get through! I found out quickly enough that gorse bushes are a lot thornier than I had first realised and I was picking thorns out of my arms and legs for days after. Not to mention how sore my arm muscles were from all the sawing! However, the whole experience was so rewarding that it was easy to overlook these details. ‘I have never done so much sawing in my life, ouch!’ Dave Halliwell, 19. This volunteering trip was very worthwhile and it was so satisfying to see the difference we had made by the end, in comparison to how the area had looked at the start of the day. It was great to meet other volunteers and to see how we had helped the community as a team. The Lake District tree clearing was an enjoyable experience, with good company and some hard laborious cutting down. The experience was worthwhile.’ Zaedea Etherby, 20. On Saturday 16th February, during National Student Volunteering Week, we had our Volunteering project day in a beautiful part of Windermere with Leonard Cheshire Disability. 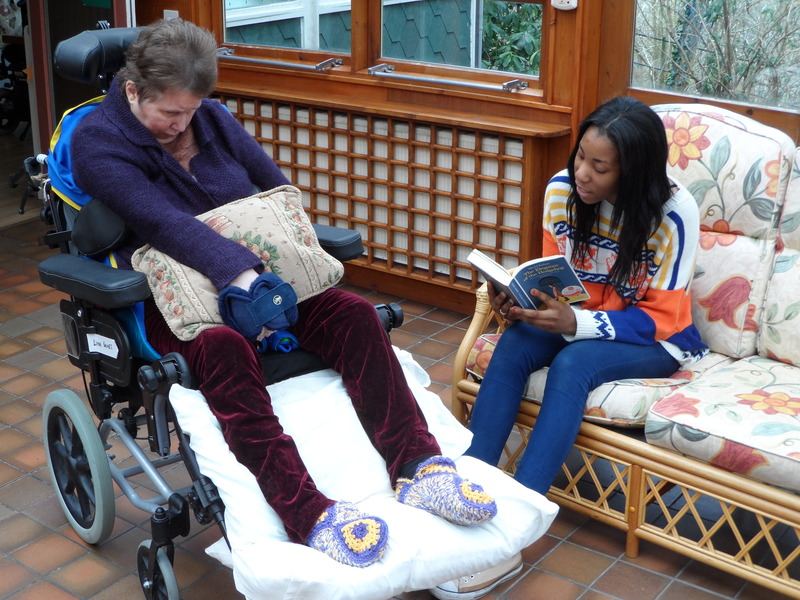 The charity helps people with physical impairments, learning difficulties and long-term health conditions, as well as their carers, friends and families. They have a home (with nursing care) at Holehird in Windermere, which is situated right next to Holehird Gardens, home of the Lakeland Horticultural Society. When we arrived, Chris the Volunteering Coordinator, gave us a tour and some background on the organisation and then we went in to meet the service users. 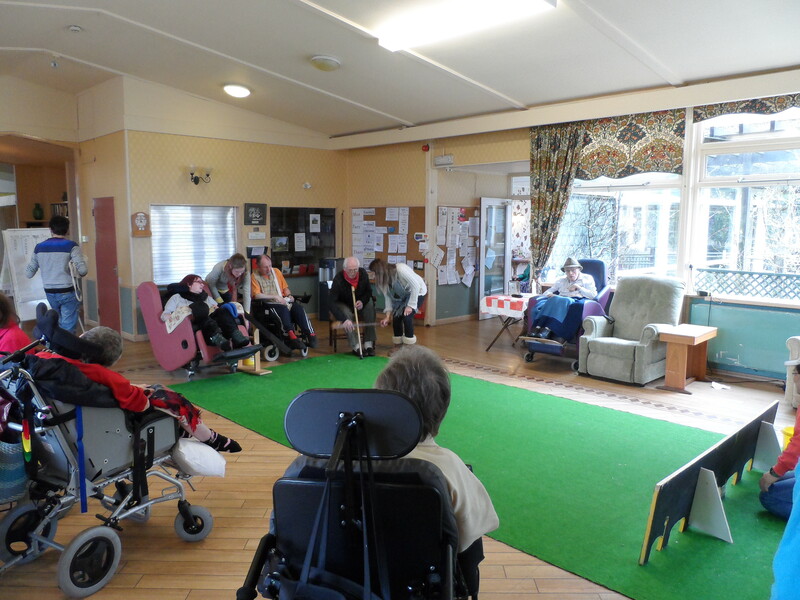 There were 9 student volunteers and some of our group stayed in the main room and played games and activities with the residents. 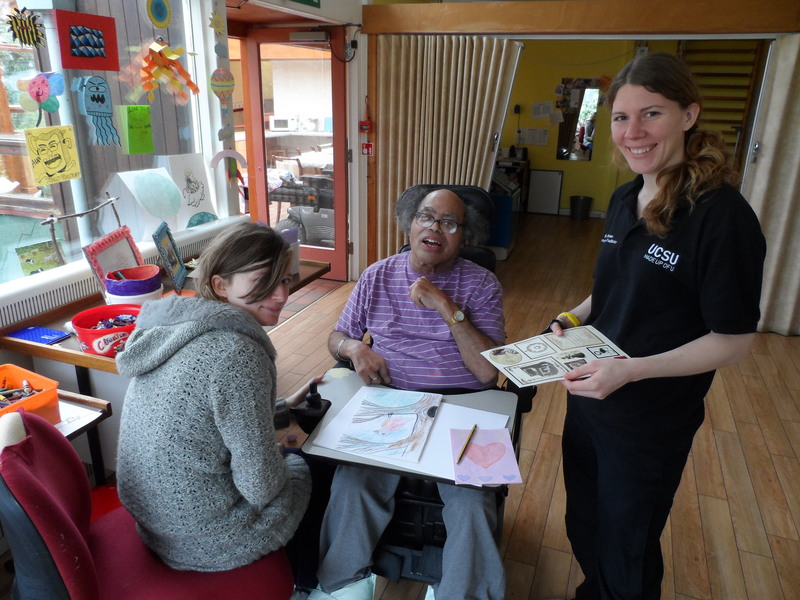 One of the service users was really keen to make cards so Zaedea, one of our creative Fine Art students, spent some time with him drawing pictures onto cards and using all the materials in the art room . Some of the volunteers also spent time with individuals, reading different books to them. 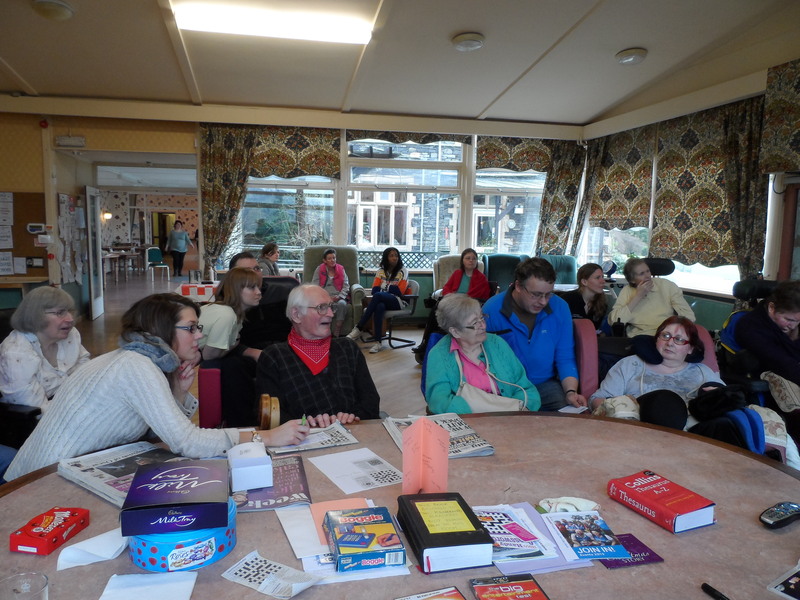 In the afternoon everyone came together and the volunteers split themselves up so that they were in teams with the residents for a quiz. This was a lot of fun and whilst not everyone was able to participate fully, it was a good opportunity to talk to the residents. Having a topic to discuss also made it a bit easier for those who weren’t as confident talking to people with learning dfifficulties. It can be hard to communicate at first and sometimes people are unsure of what to say, but after spending some time with the residents, people seemed much more confident. At the end of the day we spent some time in the holehird gardens and Chris explained that our visit had been great for the residents, and he invited people to come back in the future. 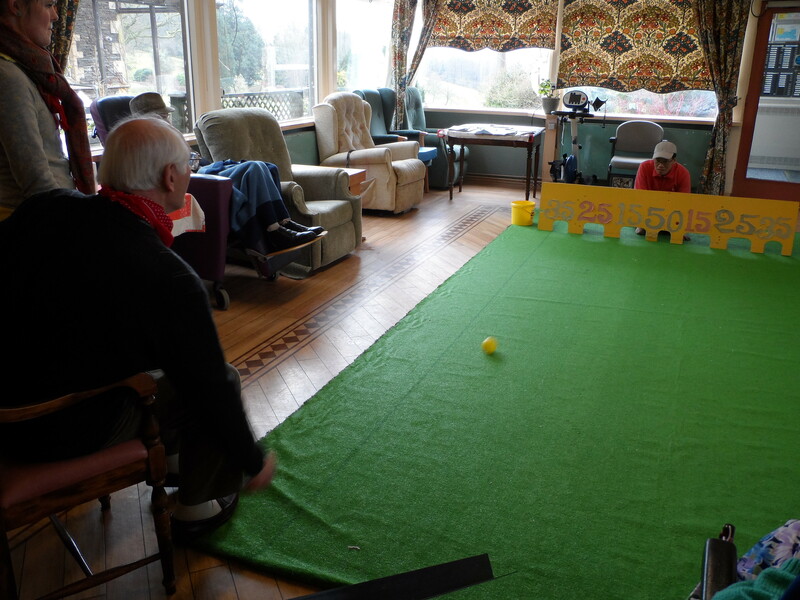 There are lots of ways volunteers can get involved, from taking part in the activities, to coming to share their hobbies and interests. For example, if there are any musicians or photographers out there, they could come and perform or put together a slide show with some of their favourite pictures.